This filling can be used for pies, pancake or waffle toppings, cheesecakes, cobbler or just use your imagination. 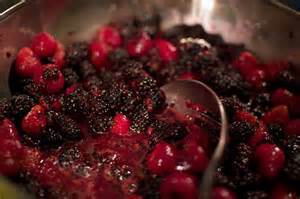 Remove from heat, mix corn starch and ⅛ cup water until smooth and slowly stir into fruit mixture and return to simmer stirring slowly. When mixture is thickened remove from heat and place in bowl to cool. This can then be used for numerous purposes. Cover and keep in refrigerator or cool completely and place in smaller containers and freeze to keep up to 3 months.